The Electronic Peak Festival is back on the 19, 20 and22 March 2019! To mark the resort’s 50th anniversary, we are bringing you an outstanding programme with two headline stars of the electronic scene. 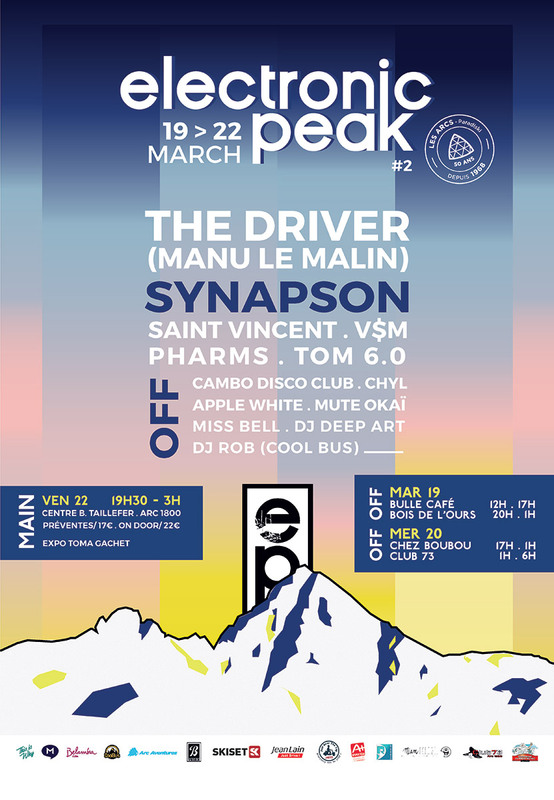 For its second appearance, the Electronic Peak will feature the incredible Synapson and the legendary Driver aka Manu le Malin, as well as local artists for a variety of musical styles. The evening will begin with VSM, an artist from les Arcs influenced by hip-hop and rap followed by Pharms, a live duo combining electronic rhythms and folk textures. The two headline acts will be supported by Tom 6.0, a d-j from les Arcs and Saint Vincent, who has proved himself on the biggest stages in Asia. From midday, at the Bulle Café in Arc 2000 for an open-air afternoon on the slopes (12.00 noon – 5.00 pm) continuing in the Bois de l’Ours Bar (8.00 pm 1.00 am). Head for the bar Chez Boubou in Arc 1800. A freestyle ski contest has been organised in the Place du Miravidi in the village of le Charvet followed by an evening in the Club 73. Come to the Bernard Taillefer Centre in Arc 1800 for a top evening from 7.30 pm to 3.00 am.